One of the first questions I had as I began researching acorns years ago was what do other groups do with them? The literature is dominated by roughly hewn recipes from either various American Indian groups or hippies. Neither, quite frankly, are recipes I am overly jazzed about. Oaks live all over the world, from Asia to North Africa to Europe to North America. And where there are acorns, people have eaten them. They have their own methods, too. Turns out the acorn-eatingest people in the world right now are the Koreans. If you go to a good Asian market, there is a good chance you will find acorn flour and acorn noodles, which look just like soba noodles. From what I can tell the noodles are eaten in the same way soba noodles are; and yes, they also appear to a lesser extent in Japanese cuisine. Any Korean food experts out there? My question is whether acorn flour and noodles are considered low-class or poor people’s food. Because that is their stigma everywhere else in the world, best I can tell. This is interesting. A certain set of scholars think that sometime around 10,000 years ago, humans — who ate acorns with aplomb at the time — grew in population to the point where they were overeating them and threatening the oaks. Great big oaks that gave sweet acorns would be in demand and might even be fought over, as the Indians did in parts of California. So with too few acorns and a burgeoning population, the scholars theorize that the people looked to wild grains as a secondary source of vital carbohydrates. And carbs are key to a hunter-gathering society; remember the Forager’s Dilemma? Turned out these wild grains — emmer wheat, spelt, barley and rye — domesticate easily, are annuals so can be planted anywhere if your tribal group moves around, and give easily collectible seed that is lighter than a big ole’ bag of acorns, which have a pretty long lag time from acorn to acorn-bearing oak. And good luck moving a giant oak when invaders arrive, but you can flee with some barley seed and plant again next spring. Acorns, which are, for the most part, bitter and need to be water-leached at least once or twice to be palatable, fell by the wayside. Acorns also lack gluten, which is vital in making bread items stick together. Wheat, barley and rye all have at least a little gluten. 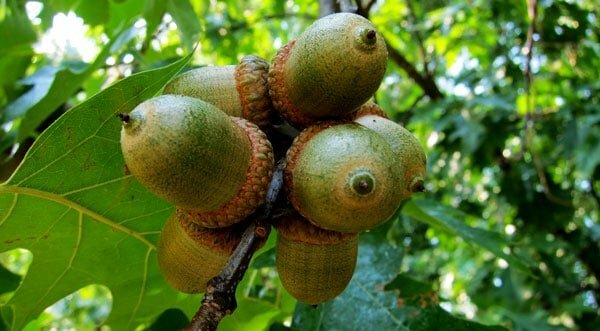 So acorns, and in Europe chestnuts, which have a similar consistency, fell to the status of emergency or famine foods. A fixation with whitened wheat flour furthered this. Black bread was for peasants, and acorn cooks up dark. It’s the sugars in them. Consequently, you need to search far and wide for acorn recipes in European circles. North African Berbers do use them, however. I corresponded with Paula Wolfert, who wrote the great Couscous and Other Good Food from Morocco, which is the sine qua non of Moroccan cookbooks. Wolfert told me that Berbers will sometimes make couscous from acorn flour. Fascinating. I have heard that Italians will make acorn flour pasta, too. I developed my own recipe for acorn flour pasta here. Another source on Moroccan food tells me they also roast and salt acorns and serve them like roasted chestnuts. 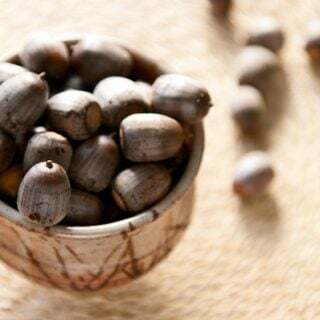 Linda Berzok, who wrote American Indian Food, says that the Indians around Tuscon, Arizona, sell roasted acorns from the Emory Oak, which are so sweet they don’t need leaching. An expert on Mexican food says in Chihuahua they do the same thing; makes sense, as the Emory Oak lives there, too. Back in Europe, acorns from the cork oak are pretty sweet, and those that the famed jamon iberico pigs eat, the bellotas, reputedly need no leaching. Janet from The Old Foodie sent me a recipe for acorn bread from an English book written in 1802 that is a little like the acorn flatbreads I made last week, although with no wheat flour. These English acorn cakes are more like acorn meal hamburger patties cooked in embers. In Europe, the thread running through most acorn and chestnut cookery is that they are fillers when wheat flour is scarce. Considering the reverence many groups have for wheat it’s pretty easy to see why anything they need to fill out a bread recipe would be seen as an adulteration, not an enhancement. 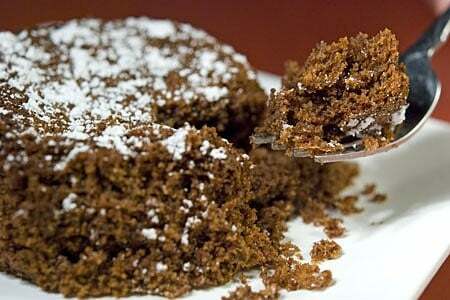 There is one European food that uses acorns that isn’t stigmatized: It’s an acorn cake. 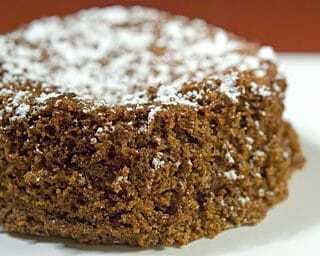 The Italians make a chestnut flour cake called castagnaccio, but it contains no leaveners. I imagine it’s like a hockey puck. So I Frenchified it and added beaten egg whites, baking powder and baking soda. I baked it in little ramekins and topped it with powdered sugar. Now I am not a cake maker. The cake itself was really crumbly — too crumbly for my taste. But the taste of the cake was amazing! It was a dead ringer for a gingerbread cake, only there was no gingerbread spices in it at all! I was shocked. All that’s in it is acorn flour, eggs, honey, olive oil, sugar and a pinch of salt. How did it get to be like gingerbread? Must be the acorns. 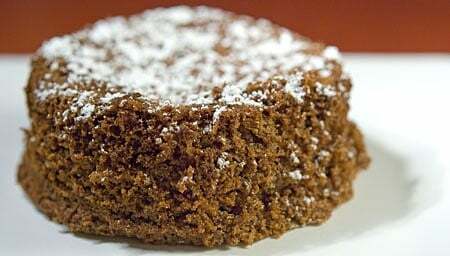 I found a version of a chestnut cake like this in an old Gourmet magazine, and this acorn cake recipe is a riff off that. These are lovely done in a 9-inch springform pan, but are equally good in buttered ramekins. Be sure to use a small circle of parchment paper on the bottom of the ramekin, and butter both sides. This will help you get the little cakes out easier. Oh, and don’t forget they rise, so don’t fill them too high. Grease the springform pan or ramekins. Preheat oven to 350°F. Mix the acorn flour, wheat flour, baking soda and powder and salt in a bowl. In the bowl of a stand mixer, or in another large bowl, beat the egg yolks, oil, honey and 2 tablespoons of sugar together until it looks like caramel. Mix in the dry ingredients. In another bowl, add the egg whites and just a pinch of salt and beat into soft peaks. Add the remaining sugar and beat a bit more, so the whites are reaching the firm peak stage. Fold this into the dough a little at a time gently. Pour, or really gently place, the dough into the ramekins (remember they will rise!) or the springform pan. Using a rubber spatula flatten out the top and place in the oven as fast as you can. Bake for about 30 minutes. After 20 minutes, watch for burning, as acorn flour browns faster than chestnut flour. Remove from the oven, let rest 5 minutes, then turn out onto a rack to cool. When they have cooled for a good 15-20 minutes or so, dust with the confectioner’s sugar. Want to do more with acorns? Read how to make acorn flour, grits, and make all sorts of recipes using acorns, right here on Hunter Angler Gardener Cook! Awesome, thanks for the info! I want to try this. I am reading about the Druids and they think the word is cognate with the Greek “drus”, meaning “an oak”, and “wid” meaning “to know” or “to see”. My book says “The origin of the Druid caste has had its root in the ‘food gathering age’ when extensive oak forests covered Europe. We are speaking of a period prior to 4000 BC when primitive hunter gatherers saw the oak as a symbol of plenty, collecting acorns as a means of food and finding them easy to store for more difficult days….According to Pliny, the acorn was ground and baked into bread. Publius Ovidius Naso, the poet Ovid, speaks of the acorn as the first food ever given to humans when they were dropped from the great tree of the sky-god Jove or Jupiter. Strabo speaks of acorn bread as a staple diet of the Celts of Iberia, while the Leabhar na Nuachonghbala, composed about AD 1150, records that in one particular bad year every ear of corn bore but one grain and every oak only one acorn, which indicates that the acorn was still regarded as an article of food classed with grain by the Irish”. So it sounds like the acorn may have been one of the earliest foods at the origin of man. I think that’s really cool and it makes me kind of sad that your sources say modern Europeans scoff at it!